The computer once described as an “iconic multimedia system”, as opposed to just a PC, has just welcomed new versions exclusive to the UK – the XPS One 24 and XPS One 24 (PRODUCT) RED. That great whopping screen you’re staring at is a 24-incher (hence the name) edge-to-edge 1080p HD display, which is coupled with a wireless mouse and keyboard, with connection ports kept at the back. As well as being given the option to join forces with Bono and the RED charity, there are also Blu-ray options and like most PCs, the option to mess with the size of the hard drive. So, seeing as there’s a [PRODUCT] RED version, each purchase of this particular model will see £35 donated to the Global Fund fighting AIDS in Africa. Specs-wise, you’re looking at the option of either an Intel Core 2 Duo E7200 or Intel Core 2 Quad Q7200 processor, 2GB of RAM, the option of a 320GB or 500GB hard drive and NVIDIA GeForce 9600M GT video graphics. 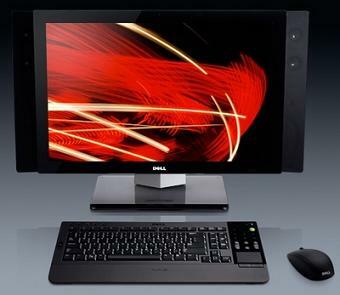 Dell’s 24-inch machines also pack a TV tuner and remote control, webcam and built-in “premium” 25W JBL dual speakers and subwoofer. Prices start from £1,399 in either midnight grey or white options. Click here to get yours.